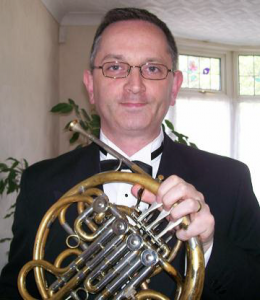 Dean Foley studied French horn under Jeffrey Bryant at The Guildhall School of Music & Drama from 1986–89. He went on to freelance predominantly with the Royal Philharmonic, Philharmonia and Covent Garden Royal Opera orchestras. He also appeared as a guest player with the London Symphony Orchestra, London Mozart Players, the BBC Symphony and Concert Orchestras, as well as the BBC National Orchestra of Wales, and the Royal Liverpool Philharmonic and Bournemouth Symphony orchestras. His freelance career reflected Dean’s eclectic taste in music, being at first the horn player for the National Youth Jazz Orchestra and later the resident horn player at the National Theatre. Several West End shows and numerous commercial and film recordings meant a busy schedule in and around London. He also appeared in the 1990 final of Les Dawson’s Opportunity Knocks on the BBC, along with his quintet Thames Brass. Dean taught French horn at the prestigious music school The Centre for Young Musicians in Morley College and conducted the Senior Brass Ensemble in repertoire classes and performances. He also coached the London Schools Symphony Orchestra and Wind Band during half-term and summer courses. Dean retired from professional horn playing in 2004 and took a four-year break before taking the instrument up again as an amateur. He joined the Brentwood Philharmonic Orchestra’s horn section in 2010.